A small group of innovative Chief Marketing Officers (CMOs) is helping their organizations generate on average 11 percent higher shareholder return compared to industry peers by delivering hyper-relevant customer experiences, according to a new report from Accenture. These marketing leaders – the pioneering 17 percent – are driving transformational change at the highest levels of their organizations helping them to respond quickly to changing customer needs. Way Beyond Marketing – The Rise of The Hyper-Relevant CMO report from Accenture surveyed nearly 1,000 CMOs and more than 500 Chief Executive Officers (CEOs) from the largest organizations around the world to understand the impact of marketing in driving business growth. The study found that an innovative group of CMOs are driving significant growth by rewiring their organizations to enable better integration and collaboration to deliver superior customer experiences. 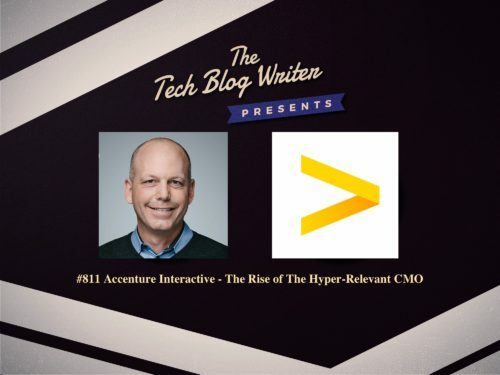 After hearing the announcement at the Adobe Summit in Las Vegas, I caught up with Glen Hartman, Senior Managing Director, Accenture Interactive North America and Global Digital Marketing. We discuss the report and much more on my daily tech podcast. Accenture Interactive is a more than $6 billion business unit dedicated to helping the world’s leading brands create the best customer experiences on the planet. Accenture Interactive has been ranked by Ad Age as the largest and fastest growing Digital Agency globally for the past three consecutive years (2016, 2017 and 2018). Recognized as an Adweek 50 honoree in 2018 and previously cited by Forbes as a “top 10 influencer” in digital, Glen leverages his 26 years of experience in digital transformation and omni-channel marketing to help brands engage and delight customers and embrace digital disruption. Glen leads Accenture Interactive in North America and has global responsibility for Accenture’s Marketing offerings including management and integration of acquisitions: Acquity Group, Fjord, AvVenta, Chaotic Moon, Media Hive, Clearhead, Intrepid, Wire Stone and Meredith Xcelerated Marketing (MXM). Glen’s market perspectives on digital transformation and customer experience have also been featured in The Wall Street Journal, Harvard Business Review, Forbes and Ad Age.